The Stanton Hall in Church Piece can be booked for classes, meetings, parties and events from 9am to 10pm, seven days per week. Facilities include a large function room which is fitted out with the very latest projection and sound systems, tables, chairs, small kitchen and toilets. Current activities include regular yoga classes, pilates, Tai Chi, community meetings, open markets, etc. The Stanton Hall has full disabled access, including toilet facilities, and a hearing loop. Cost of hiring the Stanton Hall: £16 per hour including use of the fully equipped kitchen. There is a fully equipped kitchen. If you would like to request a booking for Stanton Hall - please complete the booking request form. 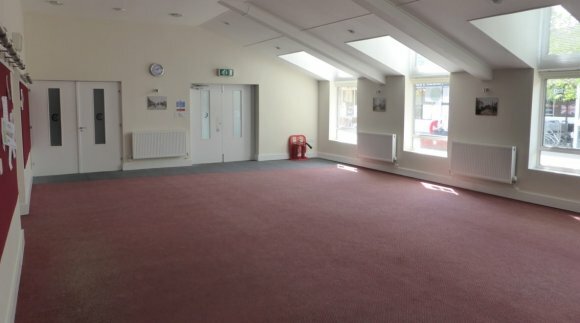 Also available for hire is a Conference Room suitable for business and committee meetings, interviews or focus groups. It has a wall-mounted flat screen television, which can be used for presentations, and an AV system plus a white board and pin board. The Conference Room has full disabled access. Cost of hiring the Conference Room: £10 per hour, including use of the kitchen. If you would like to request a booking for the Conference room - please complete the booking request form. HTML5 validated. WCAG compliant. Page generated in 0.0908 seconds.